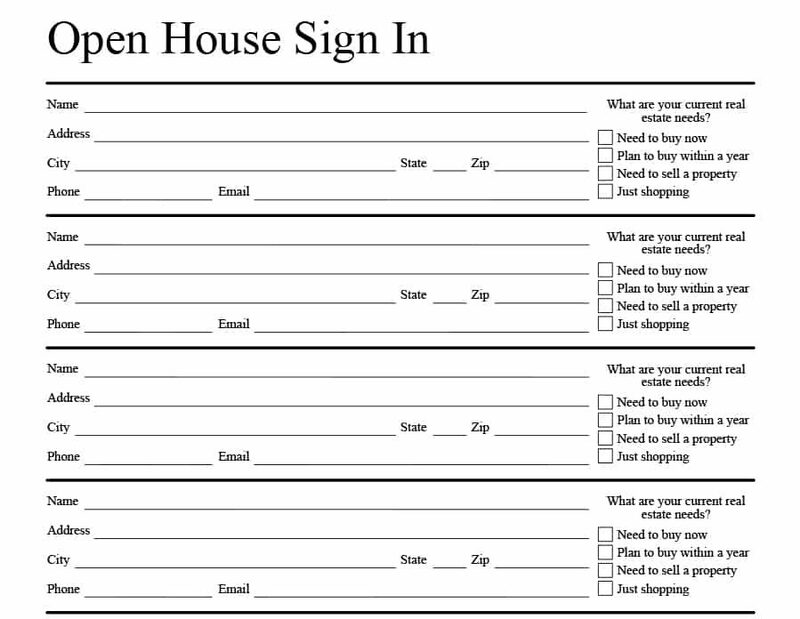 An open house sign-in sheet enables real estate agents to collect contact information from visitors who become sales leads. These are best for any agent who focuses on open house property showcases. Make sure they’re filled out completely, then use a CRM to track your new leads and convert them to clients. A real estate-focused CRM like Freshsales can help you convert open house client leads faster. You can quickly create client profiles and keep track of all the follow-up contact you’ve had with them, including emails or phone calls. Even better, Freshsales offers a 30-day free trial. Click below to sign up. 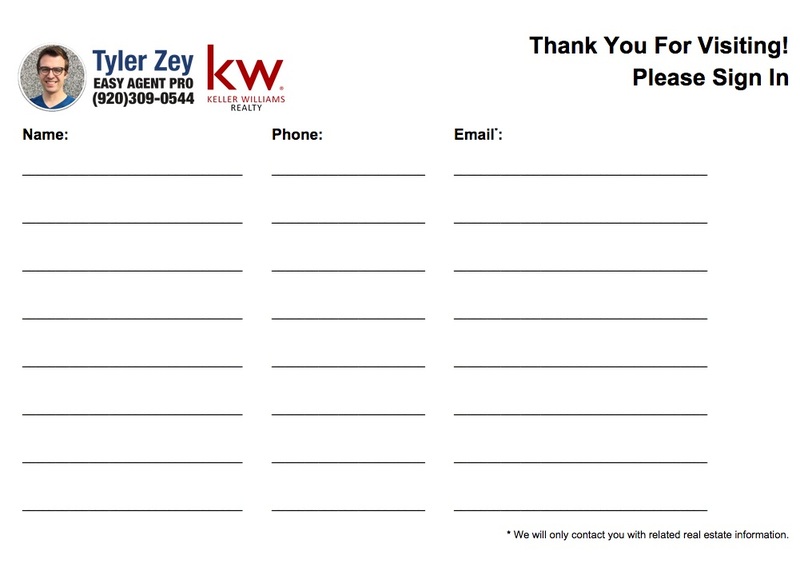 A real estate open house sign-in sheet typically asks for a visitor’s name, email address, and phone number. 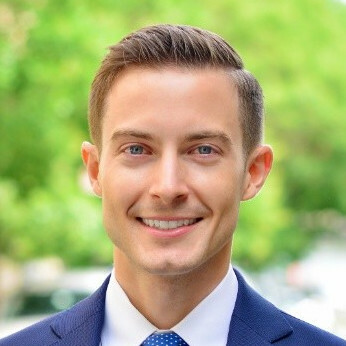 However, depending on how you intend to follow up with your prospects, you may also ask for a physical mailing address or additional details about their real estate needs. 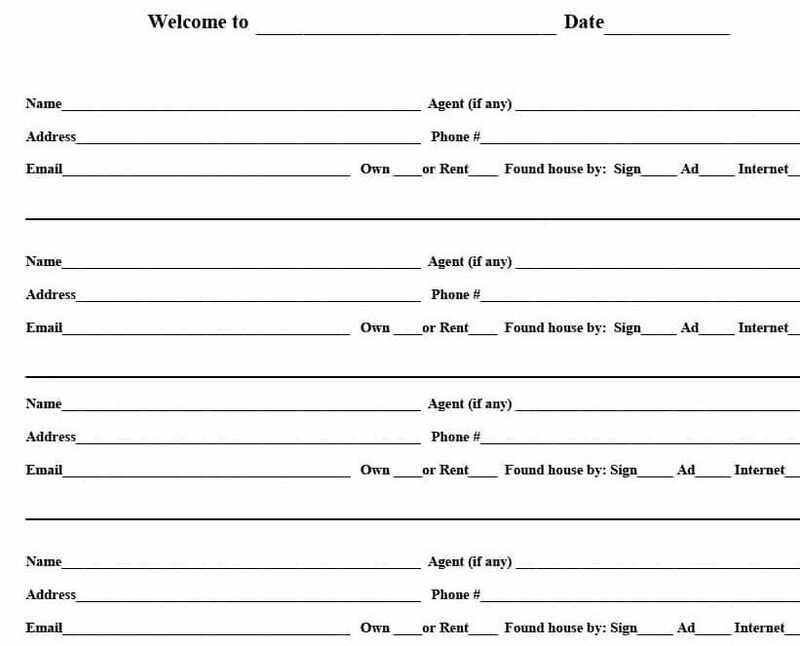 Choose the sign-in sheet template that’s right for each open house or opt for a digital option. The Essentials sign-in sheet captures visitors’ basic contact information like their names, phone numbers, and email addresses. It’s ideal if you expect a lot of visitors because it will keep a crowd from gathering around the entrance and people skipping over the sheet entirely. Included at the bottom is a brief notice that you’ll be sending real estate-related information in the future. 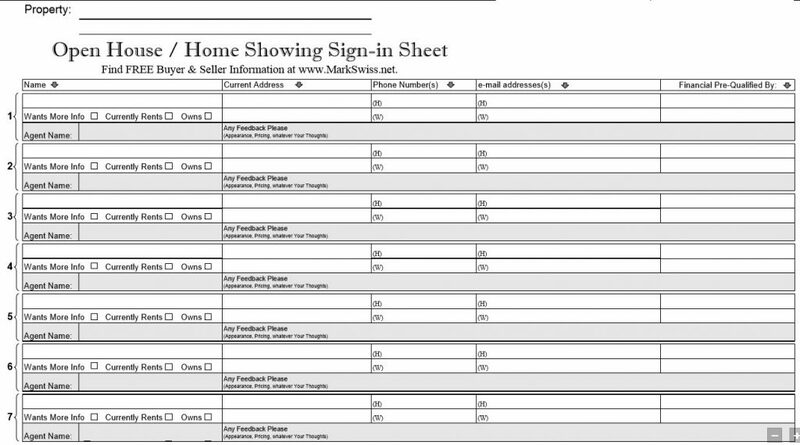 Like all of our sign-in sheet templates, the Essentials includes a space to enter the address of the open house so you can track leads based on their properties of interest. 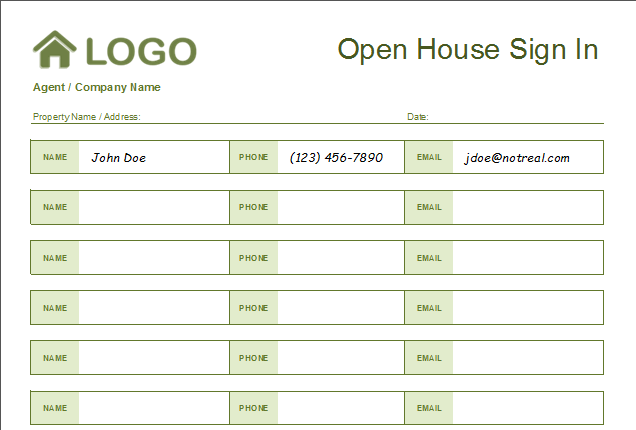 This template only asks open house visitors to leave their name, phone number, and email address. What’s more, the sheet includes a note promising that visitors will only be contacted with information and inquiries that are relevant to their real estate needs. Use the Essentials sign-in sheet if you just want to capture basic contact information that you can easily add to your CRM. This is a great option if your marketing strategy is largely email-based and you don’t plan to send out postcards, brochures, or other printed materials. 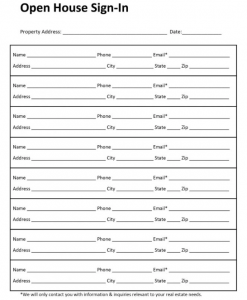 This more detailed Physical Address sign-in sheet includes everything from the Essentials along with a place for a place for open house visitors to leave their home address. Because of this, it may take longer for people to fill out. However, even in a world of email and digital marketing, gathering a physical address can be incredibly useful. 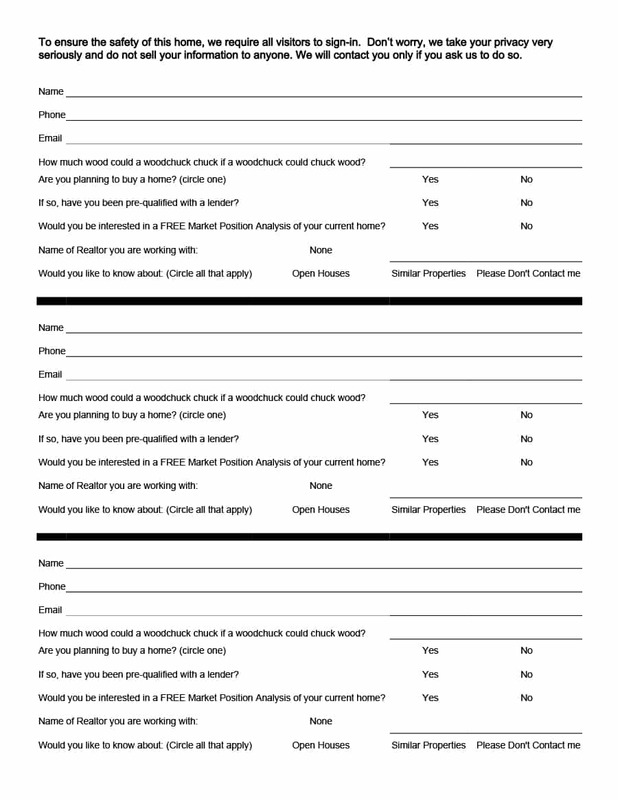 Use this template if you employ direct mail for marketing. Along with the information in the “Essentials,” this sign-in sheet asks for the buyer’s physical home address so you can use it in direct mail marketing campaigns. You can also request some additional information regarding whether they own or rent their home or when they plan to move. Providing additional information may take open house visitors longer, but a visitor’s address can provide information about their current home and neighborhood, while also increasing the success of your direct mail campaigns. 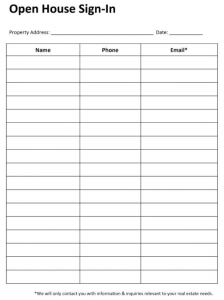 Opt for this sign-in sheet if you use direct mail marketing like postcards, flyers, sports calendars, or other methods that capture attention in your farm area. Postcards and other direct mailers enable agents to share new listings and recently sold properties in a way more memorable than a fleeting email. To learn more about direct mail advertising for real estate and get inspired for your next direct mail campaign, check out our real estate postcard templates. The “Detailed Questionnaire” format includes a few multiple choice questions about each visitor’s situation and preferences. This more detailed information helps agents determine where individual leads are on their buying journey and how best to follow up with them. 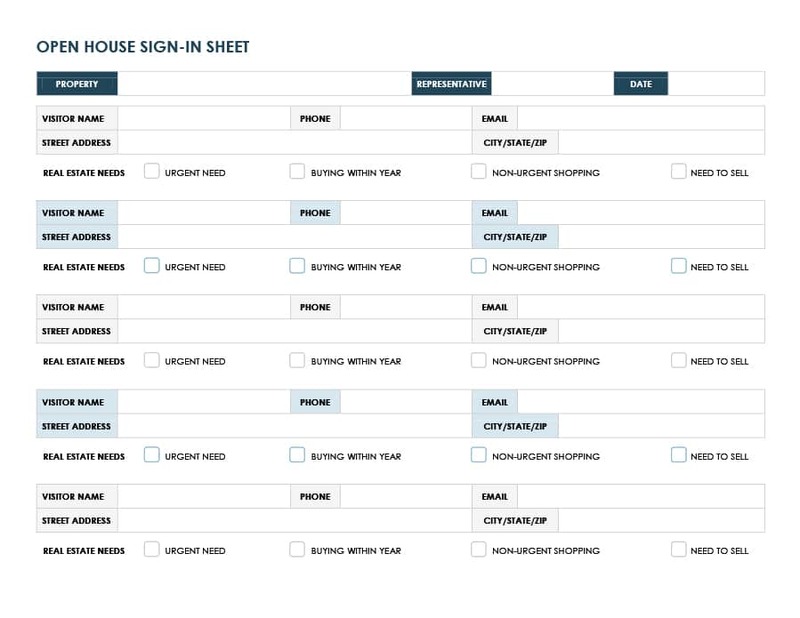 Choose this sign-in sheet if you have an advanced lead management and nurturing system that lets you send targeted, segmented marketing emails. 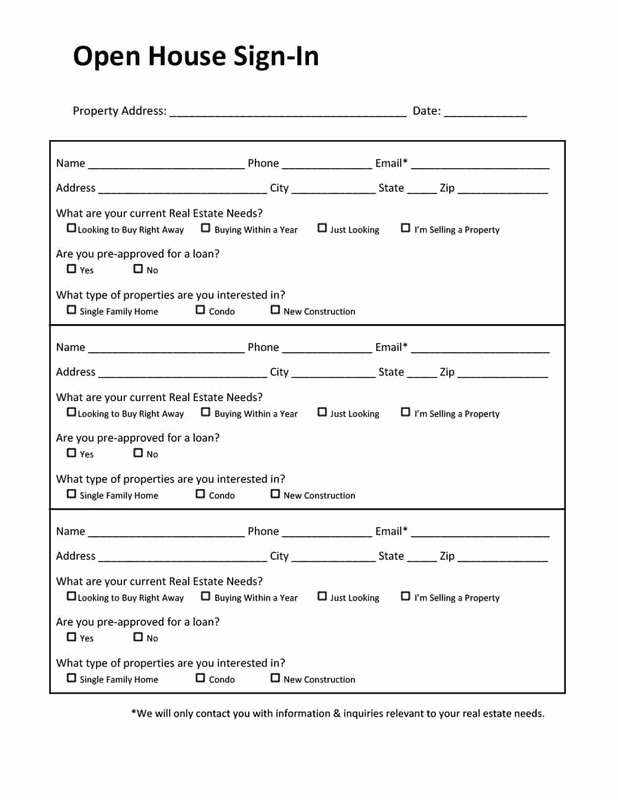 Along with the information in the “Physical Address” sign-in sheet template, this real estate open house sign-in sheet includes a few multiple choice questions about the visitor’s situation and preferences. How did you find out about this open house? 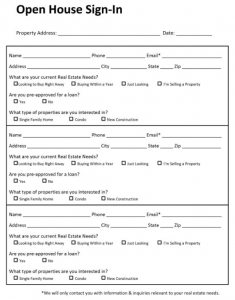 While this real estate open house sign-in sheet gives you a lot more information about your visitors, the downside is that visitors may feel less inclined to fill it out. If you use this longer form, you may need to do some prodding and be a little more insistent: “Go ahead and fill out the sign-in sheet, and we’ll give you the tour!” Check out our tips from the pros to help incentivize visitors to fill out longer sign-in sheets. The additional information you can gather with the “Detailed Questionnaire” template is perfect for agents who use a CRM to send marketing materials to segmented contact lists. This is because specific details about visitor home preferences, buying timelines, and loan pre-approval can help you convert leads more efficiently. By collecting this information with an open house sign-in sheet, you can enter it directly in your CRM to help you craft drip email campaigns. Planning and hosting an open house can take a great deal of time and resources. However, you can use Vistaprint to order copies of your sign-in sheets and open house flyers and have them delivered to your office. Not only can you use Vistaprint to design and print open house materials, you can order postcards and brochures and use them to follow up with leads after the event. We live in a digital age where you no longer have to spend your Saturday evenings deciphering messy handwriting and entering information from a sign-in sheet into your CRM. Use a digital sign-in sheet like those available through Zoho’s online form builder to simplify the sign-in process and streamline entry of visitor information in your CRM. 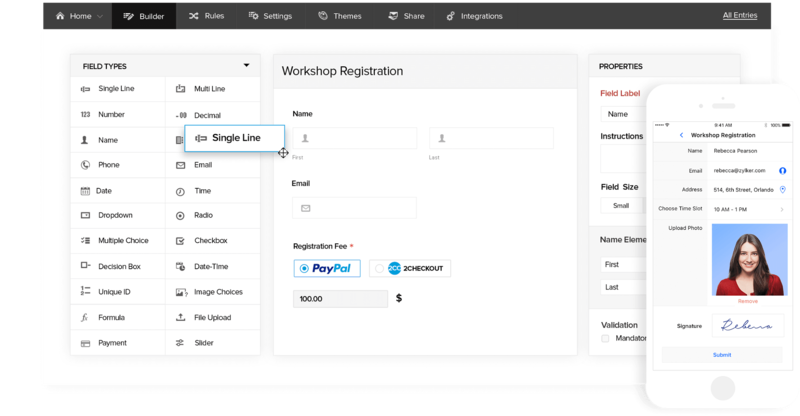 Zoho’s online form builder lets you personalize your sign-in sheets with over 30 field types, customizable themes, and an easy-to-use, drag-and-drop editor. What’s more, you can use Zoho’s mobile apps so you can fill out the forms offline. Check out Zoho’s free online form builder to create a sign-in sheet for your next open house. Once your open house is planned and your sign-in sheet is printed or set up on a tablet, the next challenge is getting your visitors to provide their contact information. Many open house visitors are reluctant to give out their personal information, making it difficult to follow up with potential leads after your event. We spoke to real estate agents to get their go-to tips for capturing leads at your next open house. To capture emails and sign-ins at our open houses, we directly walk up to people and ask them to sign in. We have about a 90% success rate with this instead of just asking someone to please remember to sign in and leaving the form on the kitchen table. 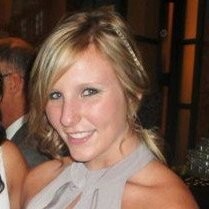 People usually will avoid giving out their information because they know we will be marketing to them. However, it’s worth the effort. About 17% of our houses get sold to people who have signed in at open houses after we have put them into a follow-up campaign. We know that they are going to buy a house quickly in our local area. How well we market determines whether or not the house they buy is from us or not. I am a realtor in the Scottsdale/Phoenix area and for open house sign-in sheets, I simply say to the potential buyer: “For the safety and security of the seller, they have asked for all visitors to sign in.” Rarely have I ever had an objection. Before the visitor leaves, I confirm their name and contact information, and ask if it’s okay if I follow up with them. Keep it simple and honest. Getting contacts is not in itself useful. 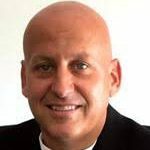 Agents must distinguish themselves in conversation with open house visitors. Prospective buyers should feel comfortable, receive expert answers, and not experience pressure from the agent. Without rapport and a mutual interest in continuing the conversation later, agents are likely to get junk email addresses and false numbers. One really cheap, easy, and effective way to compel people to sign-in at your open house is by offering them something. The giveaway can be anything. You could raffle off a nice water bottle at the end of the open house or give out $5 Starbucks gift cards. Even just getting buyers to focus on the sign-in process will make them more likely to sign in. By offering them something, there is the added benefit of both encouraging buyers to sign in and doing so with accurate contact information. 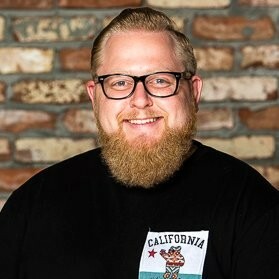 Have them post a photo on Twitter/Instagram with a pre-planned hashtag and let them know the agent will give them a $5 Starbucks gift card or that they will be entered for a larger gift card. The agent can then search the hashtag and contact each potential buyer through social media channels. This can be supplemental to a physical sign-in sheet or not. Finally, this will be free advertising on social media. These are just a few tips to help you gather the information you need. 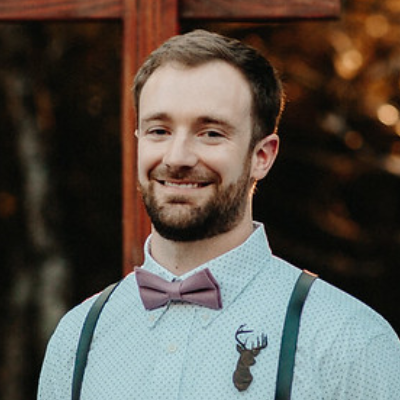 If you want to increase the attendance to get more people in the door, be sure to print out flyers using a professional company like ProspectsPLUS! and set out some open house signs. Click below to place your first order. A lead that you’ve already connected with personally is extremely valuable. This type of lead is worth investing a lot of time into with your follow-up, even if it doesn’t pay off right away. 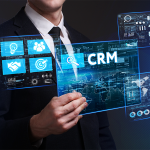 We suggest using a solid CRM and tailoring your approach in the follow-up to the type of contact you have. Immediately after the open house, enter all of your new contacts into a CRM so you can keep track of and follow-up with open house attendees. In addition to helping you organize contact information, you can use a CRM to sort prospects based on property interests, budget, home buying timeline, and more. If you’re ready to try a CRM, check out Freshsales, which offers a free 30-day trial. The day after the open house, email your new leads to thank them for coming and ask what else you can do to assist them. If you were able to have a conversation with them during the open house, add a personal touch to the message, such as, “I’d be happy to show you more three-bedroom condos.” Check out our guide to real estate email marketing for email templates and tips to get you started. If you don’t get a response through email, reach out directly via telephone. A one-on-one conversation demonstrates that you value their business and gives you the opportunity to learn more about each prospect’s needs and interests. You can then use this information to classify each lead in your CRM. For example, if a lead is unsure or has a loose time frame for a purchase, add them to your list of incubating leads and set your CRM reminders to continue nurturing the relationship. After the open house, prepare a report on the open house for your seller or, if it isn’t your listing, the listing agent. Open house apps will generate reports like these automatically. However, if you don’t have one, then create a report with the number of attendees and general feedback visitors had about the listing. When following up with your leads, ensure you have a professional online presence that reflects you and your agents well. Improve your online presence by asking former clients to leave reviews. You can also sign up for Zillow Premier Agent to help you generate more leads and enhance your professional profile. An open house sign-in sheet is a wonderful way to find buyers for your current listing and stay connected with buyers and sellers you might work with in the future. 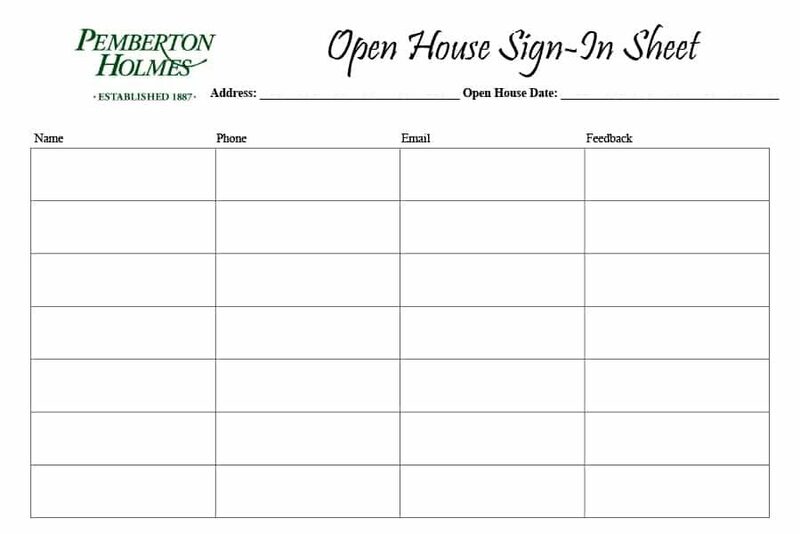 Whether presented on paper or digitally, an open house sign-in sheet is the easiest way to gather contact information so you can be sure to keep in touch. If you’re ready to collect leads at your next open house but don’t know how to follow up with them, check out Freshsales. Once you add new leads to the Freshsales CRM, you can use the software to rank prospects based on the likelihood of conversion, assign them to agents, segment contact lists, and more. Click below to try the free version today.